Had a wonderful healing session with my beautiful energy healer Debra . Had a wonderful day catching up and then a rejuvenating cleanse. I highly recommend,Didnt realize i had so much tension built in. Resentment, fear, pain of the past, what doesnt serve me I release into the universe, may it never return.Thanks soul sister. I want to tell you that the session I had with you was powerful. I have let go of the sexual anger and resentment I held on to for years and I finally feel comfortable with my physical body. Also, it rekindled the magic of my childhood hobbies, so I actually bought a guitar and started playing again. I stopped playing years ago because there was a lot of guilt my parents placed surrounding playing the guitar because I never practiced. But it is actually enjoyable now! And my vision for my future has expanded and I realize my dream of creating an internationally known, world wide non-profit. Debra Soul is a talented Integrated Energy Therapist. I got into a car accident in September 2015. I was riding my bike along a busy two way street and there was a parked car. The driver opened his door because he didn’t see me and then I fell and injured my two arms and my left knee. Debra gave me an energy healing session that night and she told me that she’s clairaudient so she can hear what the angels are trying to tell me. The angels said I needed to slow down – they were right, I was rushing to church that day. And that I needed to breathe, ignore what people tell me, follow my heart because I’m very smart and deep down I know what I want to do, and to let go of all my resentment, hate, anger toward people. She and the angels were right. I started becoming more confident in my own decisions and cut out commitments that just weren’t beneficial for me. Debra was very down to earth and helpful in my situation. I wanted to thank Debra Sulner for her healing abilities. I was in significant pain with what at the time I did not know, but I spoke with Debra and she healed me over the phone. The pain did not disappear unfortunately, but I had not been able to raise my arms and within minutes after her session, the pain was reduced to the point that I not only was able to freely move my arms, but was able to concentrate and do my job which I was severely struggling with. I do not understand how it works, and I am not a “true believer” in her magic, but the stuff worked for me anyway. A little faith went a long way for me. If you are having issues with pain, struggles with life issues or feel blocked from moving on, try her services. You have nothing to lose but you pain or unresolved problems. I recently took the basic and intermediate level IET workshops with Debra Soul. During these courses, I really enjoyed Debra’s fun energy and loving spirit. Her warm presence made everyone feel comfortable sharing and learning with one another. I loved learning about the angles, as well as, a new practice to help me heal and grow spiritually. It has been about three weeks now since the course, and I have been practicing IET daily. Each day I feel supported by the angles and I have seen some major shifts in my life, due to the energy that I am clearing. I feel very grateful for these new tools and I would definitely recommend these workshops to anyone looking to further their spiritual practice. Thank you Debra! Debra is amazing! 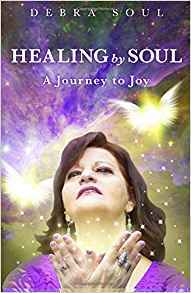 She brings a true healing vibe to all of her events and allows the spirit world to express through her. You will leave feeling light and love. – K, May 19, 2015.